Wealth Enhancement Group LLC (WEG) operates in a dual-registration environment: as the parent company of registered investment advisor Wealth Enhancement Advisory Services, LLC. (WEAS) and as an Office of Supervisory Jurisdiction (OSJ) for the broker-dealer LPL Financial (LPL). The day-to-day operations of WEG revolve around its CRM system, Junxure. Here is how WEG integrated Laserfiche with Junxure to provide a seamless experience for advisors and staff, increase productivity and maintain compliance with regulatory requirements. 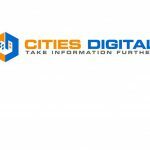 Laserfiche is integrated with Junxure using the Unfetterfiche integration developed by Cities Digital. Unfetterfiche allows WEG advisors and employees access to all Laserfiche documents within the familiar CRM environment without having to learn new software. 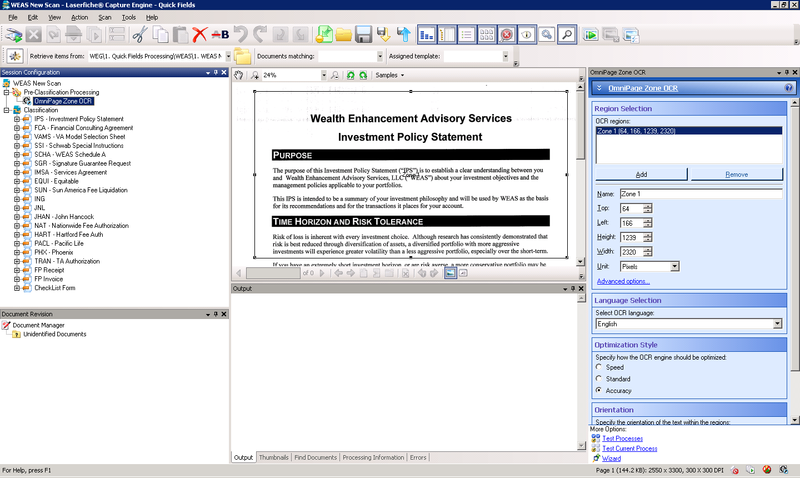 Documents in the Laserfiche repository, indexed for a particular client, are displayed seamlessly in the existing “Documents” tab within Junxure. Finding specific documents is easy by using Junxure’s existing filtering functionality. 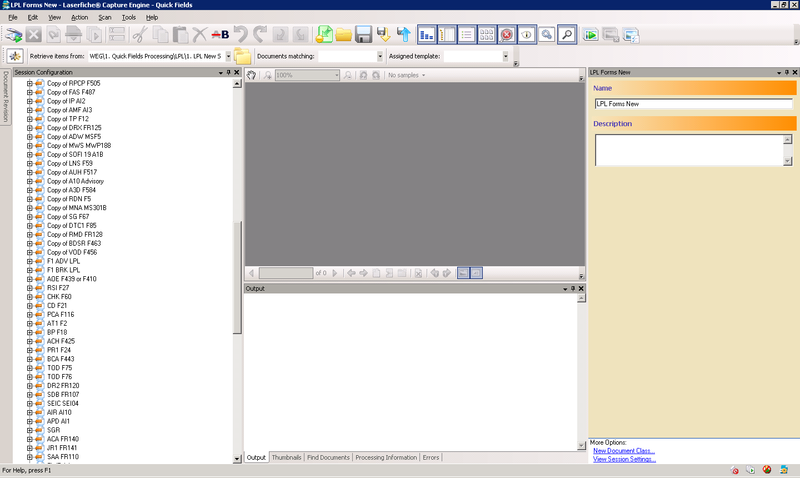 The end user simply double-clicks the document he would like to view and it will open in the Laserfiche Client. Easily switch between clients without closing the application. Drag and drop documents from the computer directly into any folder in Laserfiche. Create new folders in Laserfiche, import documents into the repository or modify existing Laserfiche documents (including rename documents and enter any metadata). Generate a printed barcode for new documents. The barcode is then placed on the first page of a document so that when the document is processed with Laserfiche Quick Fields, it is imported directly into the correct folder with the appropriate metadata appended to it. 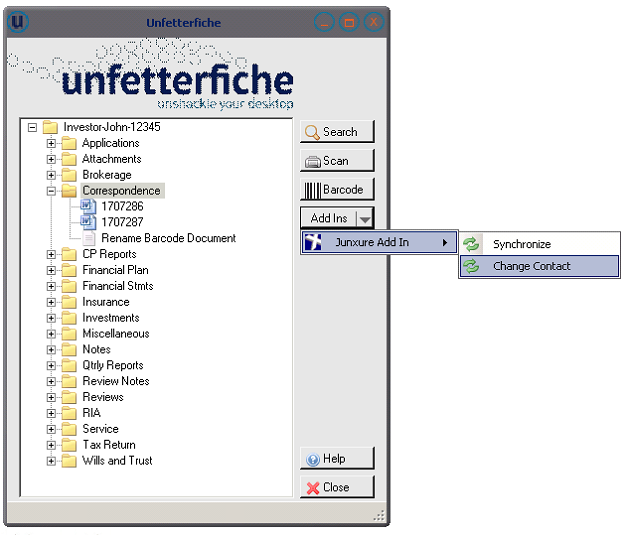 The Unfetterfiche advanced functionality can be accessed by right-clicking on the client record. 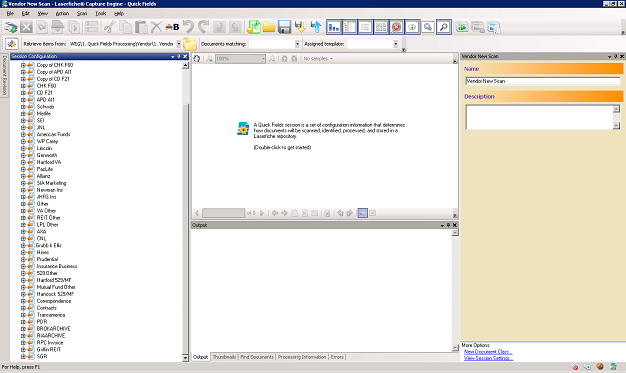 The drop down menu can be used to synchronize documents in Junxure with those in the Laserfiche repository or to change the contact to the current Junxure client record. 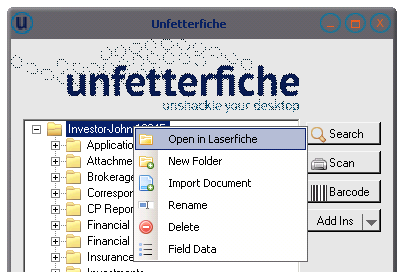 All new incoming documents at WEG are processed with Laserfiche Quick Fields. WEG has simplified 35 document flows into three separate Quick Fields sessions. The RIA Quick Fields session processes all documents related to the RIA portion of the business. The OmniPage Zone OCR process is used to identify each document and automatically assign key metadata. This improves productivity and accuracy. The Brokerage Quick Fields Session processes forms related to the brokerage portion of the business. When LPL added barcodes and updated the format of its forms overnight, all that the WEG Laserfiche Administrator had to do was copy the previous Quick Fields document classes and update a few elements, including adding a Barcode process. 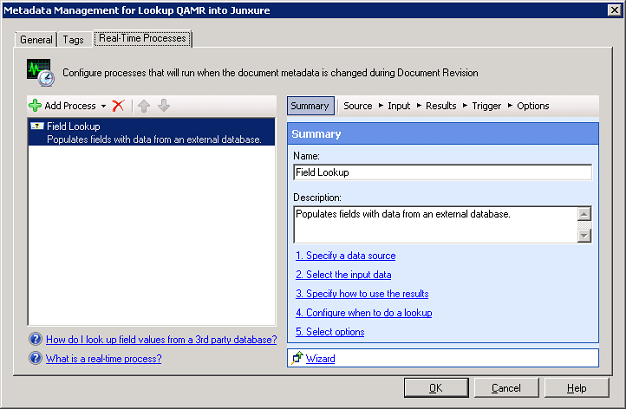 Since Laserfiche Quick Fields is so agile, copying and updating the document classes took only a day. Here is what the Brokerage (LPL) Quick Fields Session looks like, with the updated document classes denoted by “Copy of” in the naming convention. The Vendor Quick Fields Session processes documents for the various vendors. This session exclusively uses a barcode separator/cover sheet to capture the vendor documents in a batch. 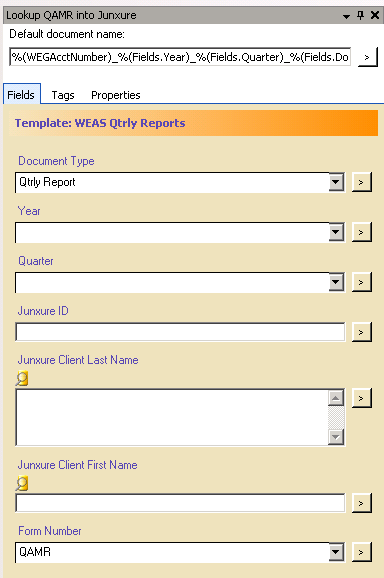 Each of WEG’s Quick Fields sessions uses the Real-time Lookup process to fill in metadata based on the Junxure ID and vendor account number. By eliminating the manual entry of metadata, WEG associates can now simply dedicate their time to performing value added quality assurance for the documents processed by Quick Fields. All of WEG’s Quick Fields sessions are run on a schedule with the help of Laserfiche Quick Fields Agent. The Laserfiche Administrator checks the Quick Fields Agent Administration Console regularly to verify that the sessions have run correctly and address any errors that may have occurred. Extracts the month, day and year from the “Date” field and converts them into tokens. Routes the document to a subfolder in the Laserfiche repository based on a value of the “Document Type” and “Document Company Name” fields. Renames the entry according to a standard naming convention. 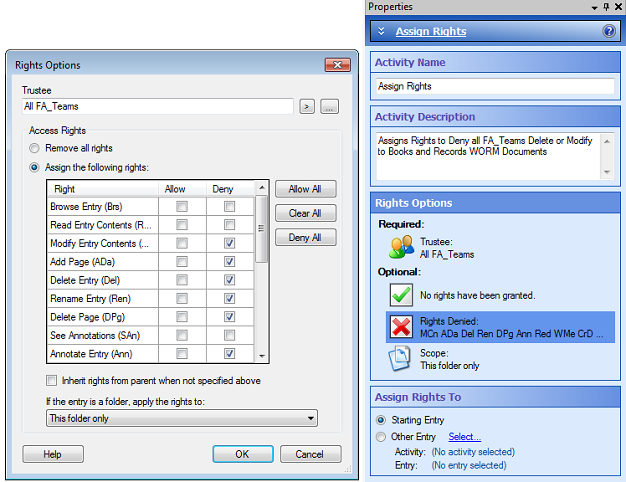 Uses the “Assign Rights” activity to take away the right to modify or delete documents by any advisor. 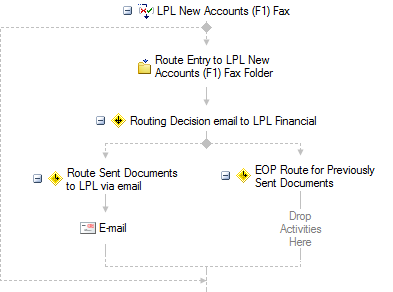 The second part of the workflow routes document short-cuts to the employee’s daily work folder. Employees review certain documents and update metadata, which triggers a secure e-mail delivery of the documents to the broker-dealer. Paper consumption has been reduced by 450,000 pages (900 reams) annually. Transparency has improved since document short-cuts allow everyone to view the same copy of a document simultaneously, including annotations with processing information. The operations and client services team no longer has to field requests for paperwork as documents are ready to view in Junxure the day after they have been received. Audits have been simplified as Laserfiche provides complete transparency regarding compliance/operations. Future physical storage needs have been eliminated and current storage needs have been greatly reduced. Access to information is secure. Only authorized individuals have permission to access specific client documents. Risk associated with physical storage theft or natural disaster destruction has been mitigated. Client records are stored and replicated on secure servers and by the firm’s designated third-party as required by industry regulations.